March came in like a Lion. Will it go out like a Lamb? Don’t hold your breath! It appears that unsettled weather will continue into the first week of April. When will spring get here? Who knows. Enjoy reloads of fresh snow while you can, and April is set up with a ton of spring events that you don’t want to miss. On April 1 don’t miss the Biggest Skiing & Boarding Event to ever come to Lake Tahoe. “The Lake Tahoe Ski Mountain Marathon”! Over 1000 participants will compete to see who can ski one run at each resort around Lake Tahoe. In this order. 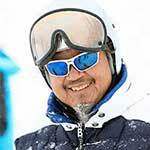 Starting at Granlibakken, Homewood, Sierra at Tahoe, Kirkwood, Heavenly, Diamond Peak, Mt Rose, Northstar, Tahoe Donner, Soda Springs, Sugar Bowl, Donner Ski Ranch, Boreal, Alpine & Squaw Valley. I have personally accomplished this with a team of 6 skiers, over 20 years ago and one of these days, I will attempt to reorganize this event in the future. Who’s In? Continuing with the #CertifiedUnserious theme. 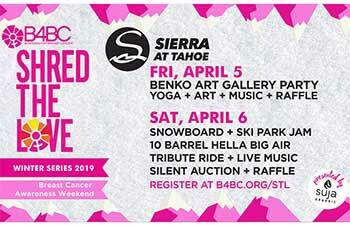 Saturday, April 6, Sierra at Tahoe will host their annual B4BC (Boarding for Brest Cancer) Shred the Love & 10 Barrel Hella Big Air Event. This event raises funds and awareness for B4BC’s breast cancer outreach, education programs and young survivor retreats. Activities are for all ages with snowboard and ski park jam, the 10 Barrel Hella Big Air Contest, live music and huge silent auction and more. 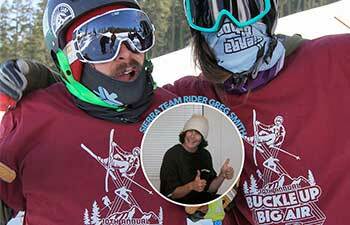 Sierra will also host the 2nd Annual Dual On Dynamite Bumps Race on Sunday, April 7. This is a throwback from the old Coors Light Freestyle Bump Series of events that I produced in the early to late 90’s at Sierra. Kenny Curtzweiler. Lake Tahoe Skibum is presenting this fun event and yes, you too can dress up or down, in your retro skiwear, crazy costume or at least dig out the onesie and compete head to head against your buddies and GO FOR IT to win prizes! 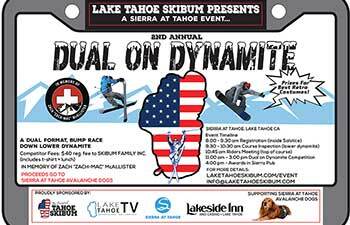 Dual on Dynamite is in memory of Zach “Zach Mac” McAllister and proceeds will benefit the Sierra at Tahoe Avalanche Dogs program. Buckle Up Big Air takes over at Sierra the following weekend. A slopestyle jam for both skiers and snowboarders of all ages and abilities, this in memory of Sierra Team rider Greg Taylor Smith and raises awareness about seatbelt safety and the importance of buckling up when in a car. Sunday, April 14, Sierra at Tahoe will host their Annual Salsa Showdown. Whip up your version of a delectable & spicy Salsa and enter the contest to win a 2019/20 value season pass. Sierra at Tahoe has not announced and closing date at the time of this writing, but there is definitely enough snow coverage to stay open at least through Easter weekend. Kirkwood Mountain Resort will be hosting the IFSA Freeride World Tour 2 Star Qualifiers & 4 Star Finals starting April 3-5, 2019. Viewing will take place in Devil’s Corral and will be a great opportunity to watch some of the world’s best snowboarders and skiers challenge the natural gnarly terrain from Kirkwood’s famed Cirque. Plus, they have extended their winter season to be open daily through April 14 and then the 3-day weekend, Friday-Easter Sunday. Get it while you can! Heavenly is set to host their Spring Fling Rail Jam on Saturday, April 6, and will be held at the base of World Cup and the following weekend, Sunday, April 13, it’s their annual Pond Skimming Event also set for the base of World Cup Run. This costume fun and zany event promises to be loads of fun and entertainment for participants as well as spectators in this skim, sink or swim event. Heavenly is extending their winter season and plans to stay open daily through April 28; Then Friday-Sunday, via access from the Gondola, May 3-5; May 10-12; May 17-19 and through Memorial Day, May 24-27. Diamond Peak and Northstar will stay open through Easter Sunday, April 21 and Mount Rose Ski Tahoe will go one more week with their final day on April 28. Up on Donner Summit, Sugar Bowl will host their Banked Slalom Event on Saturday, April 6 with a course snaking its way down the mountain and will be accessible from the Disney Lift. Then, on Saturday, April 20, they invite skiers and snowboards to Slash & Splash into Spring with the Sugar Bowl Tiki Pond Skim. Another fun Tiki themed costume event pitting skiers and boarders across a 100-foot long pool. Guaranteed to have you belly laughing! At this time, Sugar Bowl is planning to stay open through Easter Sunday, April 21. 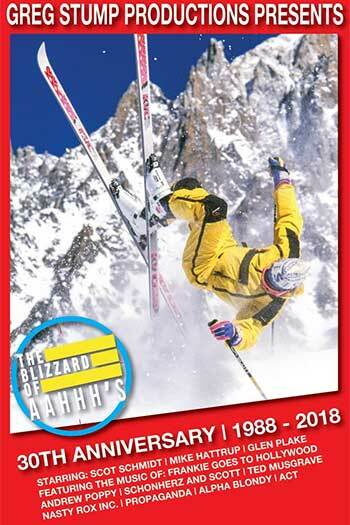 Lots of spring events will also take place at Squaw in April, including the 30th Anniversary of the Blizzard of Ahhhs screening on April 10. Producer, Greg Stump along with Glen Plake, Scot Smidt, Mike Hattrup will be joined by Jonny Mosely for a Q&A session after the premiere. This is the first time that these 3 stars of the film will be together on the same stage since the movie was produced 30 years ago. This screening will be held at PlumpJack Squaw Valley Inn Mountain Room. 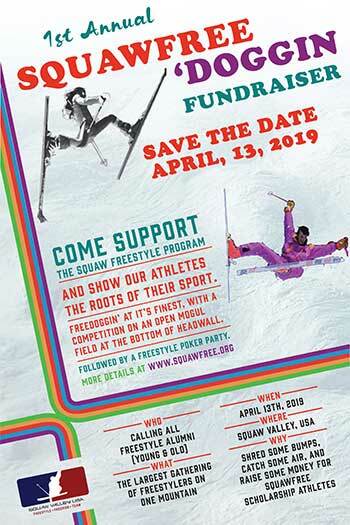 Don’t miss the inaugural (since in my mind, there is no such thing as 1st Annual) Squaw Free ‘Doggin Fundraiser, Saturday April 13. Dust off your multi-colored THE Skis, Olin’s Mark IV’s or K2 Cheeseburgers, you know the ones with the Spademan or Retractable Burt Bindings, squeeze your feet into your Scott rear entry boots, wrap your Midas Muffler around your waist and come out for some Fun Free Doggin’ on the Hill. This Old School Dual Mogul event will waken your brain cells and bring back memories of the Freedom & Fun Spirit of Hot Dog skiing from the 70’s. Squaw will also host the 29th Annual “Cushing Crossing”, their signature Spring Pond Skimming Contest on May 4. Another crowd pleasing event across Lake Cushing at the base of Squaw. Squaw is planning to stay open daily through Memorial Day, May 27, then Friday-Sunday through July 7. Mammoth Mountain is also planning a long spring season and plans to stay open through July 7 as well. 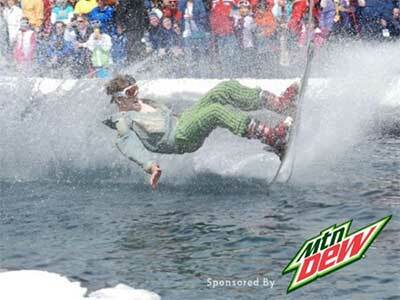 But don’t miss their annual Pond Skim Contest set for Easter Sunday, April 21. This will take place out of their Canyon Lodge. So, take advantage of the all the fun events and great spring skiing & riding ahead. I’m getting the bikes ready to roll, but I haven’t put away my winter gear yet, as it looks like we can continue making turns into July!